Why it’s daunting: Elvis Presley became a star in an era when show business didn’t have a designated track for a talented teen idol who sang “race music” and performed with raw sexuality. So the industry slotted Presley into the “fad” category, and did what it had done with so many flashes in the pan before, trying to squeeze out as much revenue as possible before the public inevitably lost interest. Shortly after Presley’s debut album was released in 1956, the singer signed a contract with Paramount Pictures, and deferred to the studio’s decisions as it worked to find the right movie image for him: western hero, juvenile delinquent, Brando-esque lump, or something else entirely. Yet Presley’s filmography isn’t entirely without merit. Some of his movies are legitimately good from start to finish; others have a cheery quality that makes them fun to watch even at their most disposable. And Presley himself had such a larger-than-life quality that he’s often fascinating apart from what’s going on around him. As Dave Marsh wrote about Presley’s movies after his death, “Only a person for whom reality remained extraordinarily mundane could possibly have stomached making these epics of impoverished imagination.” Marsh also said of Elvis that, “For me he remains most like James Thurber’s immortal-despite-himself Walter Mitty, the everyday schlep who lives as gloriously in his fantasies as any hero of ancient or modern mythology.” All of which means that even when stranded in schlock, Presley retained his rocker charisma, and even came off as realer than most movie stars. Maybe that was due to his Southern drawl and charmingly awkward, non-actorly line readings. Or maybe it was just a lucky byproduct of diminished confidence, as Presley went from being the king of one realm to a jester in another. Why: There are better movies starring Elvis Presley than Blue Hawaii, but “Elvis movies” as a genre don’t get much more entertaining than this 1961 musical/comedy/travelogue, which was so popular that it helped cement the formula that would dominate Presley’s films for the rest of the decade. Presley plays a soldier who finishes his hitch and then returns to his wealthy Atlanta family’s Hawaiian estate, determined to make his own fortune in America’s newest state rather than working for his dad’s pineapple business. Presley means to follow the lead of his girlfriend (Joan Blackman) and gets a job as a tour guide, but his snobby mother (Angela Lansbury) thinks both the work and the girl are beneath him—as are the native beach bums that Presley pals around with—and Blackman gets annoyed when Presley’s first assignment has him ferrying around a pretty young high-school teacher and her crush-prone students. One of Presley’s most purely escapist films, Blue Hawaii doesn’t try to be hard-hitting when it comes to either the tourist industry or colonialism; and the bedroom farce is both rudimentary and more than a little sexist. (To discipline one particularly bratty high-schooler, Presley throws her over his knee and spanks her.) But Blue Hawaii’s more invested in its setting than most of Presley’s ’60s films, loading up on breathtaking location footage—not just of beaches and resort hotels, but also elegant mansions, well-appointed shopping districts, and vast farmlands—and dropping in local lingo and customs. Even the music’s not bad. The big hit from the film—the stately ballad “Can’t Help Falling In Love”—endured in Presley’s live act until his death, and many of the filler songs use traditional Hawaiian instrumentation and motifs, which at least gives them some personality. Blue Hawaii was directed by Norman Taurog, who helmed more of Presley’s films than any other director, and knew from his experiences working with Jerry Lewis how to balance broad comedy and grabby little setpieces. Compared to the oft-morose plots of later Elvis movies, Blue Hawaii is like a breezy vacation, and Presley looks appealingly relaxed as every Hawaiian’s favorite haole. The success of Blue Hawaii prompted producers to set more Presley vehicles in ever-stranger places, taking him further from his own culture and his own music; and as a result, Presley’s mystique waned progressively throughout the decade, as weaker and weaker Elvis movies showed up at the local bijou roughly every four months. But Blue Hawaii shows that even Bland Elvis could have his charms. From the moment he enters the movie and sheds his military uniform for beach duds, Presley comes across like Superman trying to make a go of life as Clark Kent. It’s like he’s taking a break from being Elvis, and at this stage of his career, he still seemed to be appreciating the time off. Next steps: For someone who became famous as raucous rock ’n’ roller, Elvis Presley rarely got the chance to rock out on the big screen. 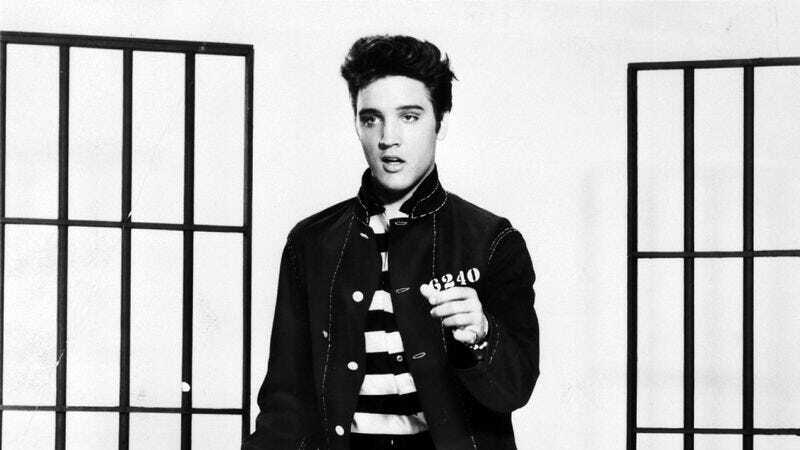 The 1957 drama Jailhouse Rock is an exception. Playing a moody blue-collar guy who lands in prison on a manslaughter charge, Presley gets to sing a handful of jumped-up Jerry Leiber and Mike Stoller songs—including “Treat Me Nice,” “(You’re So Square) Baby I Don’t Care,” and the title track—and gets to play out a story arc similar to his own life, as an ordinary joe who becomes a singing sensation and then gets courted by Hollywood. The plot’s not far removed from Presley’s ’60s comedies, with its mix of musical interludes and romantic complications, but it comes across as edgier in Jailhouse Rock, and the energy of the musical performances goes mostly unmatched in the films that followed. Presley made a few decent dramas during his Hollywood years, the best of which is 1958’s King Creole, a poised coming-of-age piece directed by Hollywood legend Michael Curtiz. As a high-school dropout who’s undermined his singing career via an association with crime boss Walter Matthau, Presley is at his most convincingly haunted; and the New Orleans setting gives the star an excuse to belt out some bayou-flavored rock and country songs, some of them again written by Leiber and Stoller. Presley also acquits himself well in 1961’s Wild In The Country, adapted by Clifford Odets from a J.R. Salamanca novel. He plays one of his most complex characters—an aspiring writer with a bad-boy reputation he’s finding difficult to overcome—and seems to feel the material more intensely than in his more frivolous films. Presley headed into the Old West more than once in his movies, including 1960’s Flaming Star, a Don Siegel-directed Western in which Presley plays a half-Texan/half-Kiowa, torn between his two worlds. It’s neither Siegel nor Presley’s best work, but it’s a solid example of the last wave of ’50s “psychological Westerns,” before the more violent ’60s oaters and revisionist ’70s films transformed the genre again. Presley tried to find a place in that next wave too, in 1969’s Charro!, playing a former outlaw who seeks to redeem himself by taking on his old gang. Audiences in the ’60s weren’t as interested in Serious Presley as they’d been when he started acting in the late ’50s, so he mostly obliged his fans by making Blue Hawaii-style “Elvis movies” throughout the decade. Most range from merely tedious to mildly offensive, but there are some pretty good ones, generally improved by the specificity of their milieu. The Phil Karlson-directed 1962 musical Kid Galahad casts Presley as a mechanic who proves surprisingly good at boxing, helping broken-down promoter Gig Young get his life back in order. It’s a brisk, likeable film, with a more cohesive plot than most Presley vehicles. Presley’s pretty good in 1964’s Roustabout, too, playing a self-centered lout who learns the value of teamwork thanks to Barbara Stanwyck’s traveling carnival. Roustabout revels delightfully in the arcane details of carny life, making circus tents and midways seem as enticingly strange as island getaways. Presley played a racecar driver in two of his better films: 1966’s Taurog-directed Spinout, in which he plays a lothario juggling three different women, a singing career, and offers from rich racing enthusiasts; and 1968’s Taurog-directed Speedway, which has Nancy Sinatra as an IRS agent who makes sure that NASCAR star Presley uses his winnings to pay his back taxes. In both films, Presley is once again more the superhero he was in his rocker heyday. He drives fast, woos well, and gets the paying customers moving. Lastly, after Presley gave up on Hollywood, he ending up making some of his most indelible movies and TV specials, doing his actual live act instead of mouthing inane dialogue between non-rocking musical numbers. The soundtrack to one of those specials, 1973’s Elvis: Aloha From Hawaii Via Satellite, was re-released by Sony Legacy last month, albeit without the video footage (which shows how Presley’s connection to the state continued after Blue Hawaii). But both of Presley’s big concert films—1970’s Elvis: That’s The Way It Is and 1972’s Elvis On Tour—are in print on DVD, and both show what the Elvis experience was like in the early ’70s, with the bombastic intros, sparkly costumes, and mix of contemporary pop hits and rockabilly classics. Presley is so exciting to watch in these films that it’s easy to see why people wanted to put him in movies in the first place, even if they were never sure what to do with him once they got him there. Where not to start: It’d be easy to needle such obviously terrible Presley product as 1964’s Kissin’ Cousins (hey look, it’s Elvis in a blonde wig, playing his own lookalike hillbilly cousin!) or 1969’s Change Of Habit (hey look, it’s Elvis as an inner-city doctor in love with undercover nun Mary Tyler Moore! ), but those are so bad that they announce their awfulness from the get-go. Far sneakier in its execrability is 1967’s painfully unhip Easy Come, Easy Go, which has Presley as a Navy frogman who finds treasure on the ocean floor, and teams up with hippie chick Dodie Marshall to retrieve it. Like the worst of Presley’s movies, Easy Come, Easy Go seems to be taking place in a world where the musical and cultural revolutions of the ’60s either weren’t happening at all, or were only worth acknowledging for the sake of mockery. It’s a harsh reminder of how Presley laid low for too long, and lost his relevance.